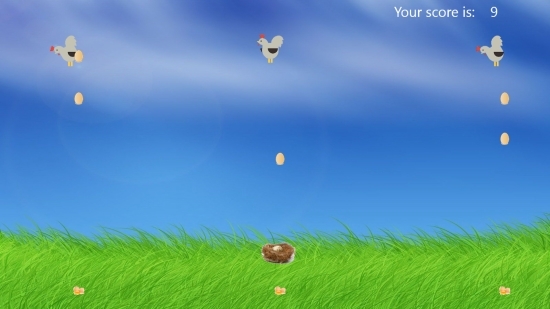 GoldenEgg is a free Windows 8 Kids Game app in which you have to catch eggs in a basket released by three hens. 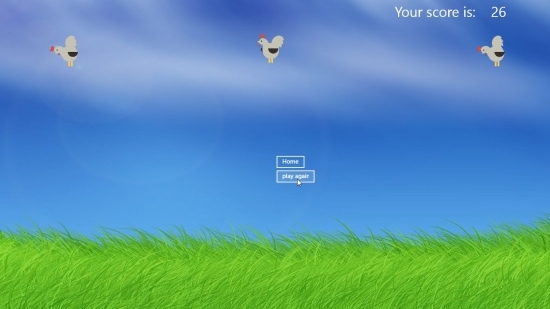 It is a simple game with quite easy game controls. 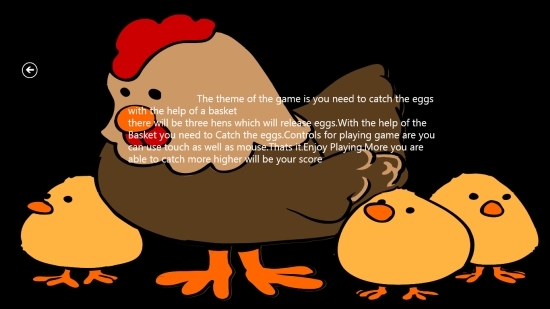 You have to try to catch as many eggs as you can to score more points. This free Windows 8 Kids Game app is a fun game for small kids, which they would surely enjoy. The cartoon graphics of the game looks quite catchy. However, apart from entertaining small kids, this game will also help kids to improve their eye- hand coordination. GoldenEggs is freely available in Games category of Windows Store. You can search for this game app in Windows Store using the Win+Q key combination or view the app directly in Windows Store by clicking on the link given below at the end. Let’s see how to play this free Windows 8 Kids game. As I said, the graphics of the game look interesting. As you launch this app, you will land on the Start screen with options Start and Instructions. You can click on Instructions option to read the instructions about how to play the game. Now switch to Start option. The next screen will display a nice field with three hens on the top of the screen. They will release eggs downwards. You have to catch these falling eggs in a basket displayed below on the ground. Move your basket with mouse to catch as many eggs as you can and score points. A sound will confirm that your catch was perfect. You can also try some other fun Windows 8 kids game apps we reviewed earlier: ABC & Me Free, Find Animals, Gems Memory. GoldenEgg is a nice game app for small kids. The simplicity of the game, easy controls, and interesting graphics make the app ideal for kids. Try it out and share your feedback via comments.